ACCEPTING BACKUP OFFERS - Financing Contingency! UNIQUE. UPDATED.NOTABLE. This UNIQUE 1926 vintage home is full of character and charm that is significant to the historic era. Pride and respect to this special home is highlighted throughout with wood floors, high ceilings, a romantic fireplace and distinct Mediterranean revival architecture. Enter through the screened front porch into the living room that features soaring cypress-clad cathedral ceilings with wood beams. In keeping with the current demands, the tastefully RENOVATED and UPDATED kitchen and baths are appreciated and impeccably maintained. The kitchen features modern appliances, Corian countertops & tiled backsplash that allows plenty of room for the chef to create culinary masterpieces. The large dining room is the perfect venue for entertaining dinner guests. Plantation shutters in many of the UPDATED windows. The peaceful family room offers gorgeous views of the outdoor space. The private outdoor space is NOTABLE with a large pool, elegant & covered lanai featuring ceiling interest, arches and skylights. Don't miss the additional studio building. Tropical landscaping with low maintenance is appealing. 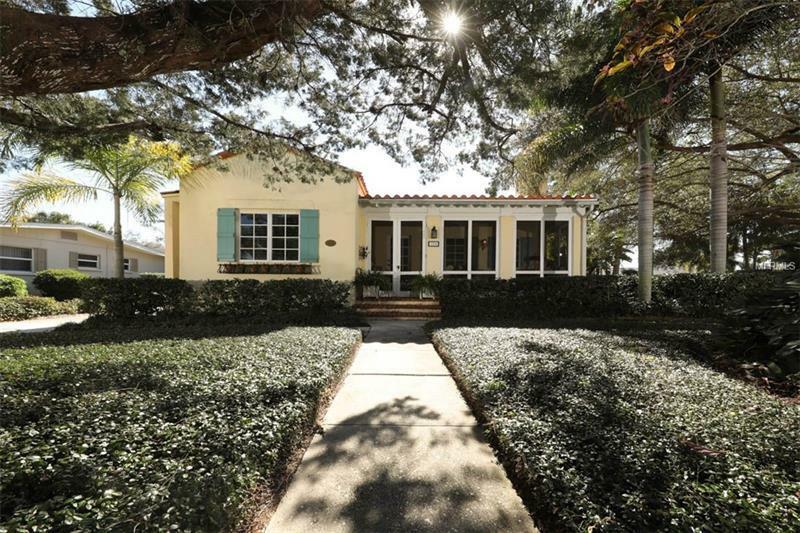 Positioned on the island of Venice, 1/2 block from Venezia Park, 6 blocks from the historic downtown Venice and close to the beaches along the Gulf of Mexico. Call to view this extraordinary and meaningful home.